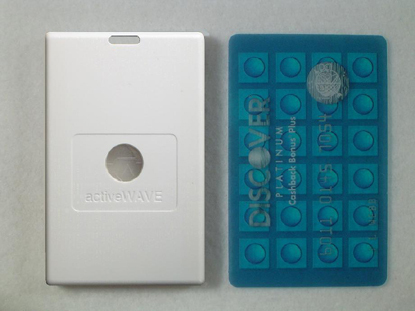 The ActiveWave jumboTag is our largest tag - slightly smaller than a deck of cards. This tag can contain both the LED and buzzer options to conveniently find tagged items easier or alert tag wearers. By using the optional bracket, this tag can be mounted easily on crates, pallets, and other containers used to hold assets. Almost any merchandise or equipment with a flat surface can be tracked conveniently with a jumboTag. In a warehouse full of aisles and shelves of tagged items, a user searching for a particular item can make a specific tag flash or beep to quickly locate it. This tag also has a slotted hole near the top for attaching a lanyard, clip, or other mechanism such that it can be worn by people for access control and tracking. If a tagged visitor enters an unauthorized area, the tag can automatically flash or beep as well as send an alert to the guard station. Typically, the jumboTag remains in sleep mode until it receives a wake up command from an ActiveWave Reader or Field Generator. If the command is intended for this tag (specific address or broadcast), then the tag will awaken and transmit its ID and other information to an assigned system Reader. Several jumboTag versions are available, each using one frequency for transmit and another frequency for receive. This dual-frequency method allows for fast and reliable communications. JumboTag options include a bracket, LED, buzzer, and various amounts of user memory ranging from 0 to 256Kbits. Even more peripheral options may be added to satisfy your application needs.